ZenCash is always on the leading edge of research and development. With 8.5% of mining rewards invested in integrations, engineering, marketing, research and development, ZenCash is constantly investing in ways to improve their platform. The team has some big R&D projects in the pipeline with IOHK and Infopulse is strategically important development partner in these efforts. Infopulse is excited to partner with ZenCash, one of the most innovative and mature blockchain companies in the world. We will work together to implement new products and protocols, like the treasury model, that will offer an unparalleled user experience, as well as increasing trust and transparency in the community. We are thrilled to contribute our experience and expertise to the development of transformative blockchain solutions on the ZenCash platform. The Zen platform’s protocol-level treasury voting system will help to improve community participation in decision-making for the network. Under the model, proposals are placed in a system, where ideas can be submitted by anyone and voted upon by Zen holders. The collaboration with Infopulse builds on a partnership between ZenCash and leading blockchain engineering company IOHK. ZenCash and Infopulse plan to implement a custom model of IOHK’s reference treasury model, which IOHK has been developing in collaboration with Professor Bingsheng Zhang from Lancaster University. The project’s goal is to launch a protocol-level treasury system containing a public ledger where Zen holders can vote to decide what proposals advance. Proposals are run on a stake-weighted system, where ideas can be submitted by anyone in the world and are then voted on and decided by Zen holders. Infopulse’s software development expertise will prove invaluable to ZenCash as we develop our treasury voting system, one of the flagship features of the Zen platform. Infopulse’s technical insights will also inform future projects and help us make critical updates to ZenCash. 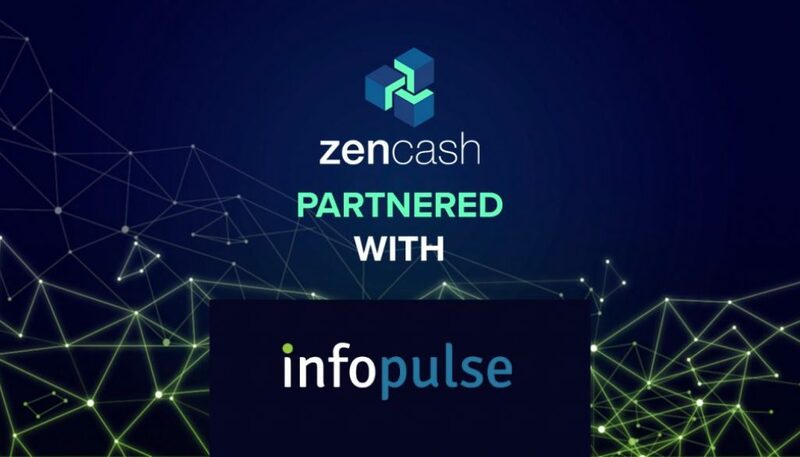 With Infopulse’s record of building innovative and sustainable software solutions, we are confident that this partnership will keep ZenCash on the bleeding edge of development in the blockchain space. Ultimately, this will allow the community to have an active role in the development of Zen while giving insight into how Zen spends community funds. This treasury project originally started off as a theoretical paper from IOHK that detailed a voting mechanism that used snarks and incentive schemes to improve voting systems. Alberto Garoffolo, ZenCash’s Software Architect, took a trip to Kiev, Ukraine to meet with the Infopulse team and our other partner, IOHK, to bring this theory to reality. This multidisciplinary and collaborative group of scientists and engineers worked together to create a product ready for production-level deployment. After a series of working groups with Infopulse and IOHK, ZenCash now has a proof of concept treasury model prototype that’s undergoing stress testing with different loads of voters ranging from 1,000-100,000 prospective active voters making votes on theoretical proposals in the system. Infopulse is a global provider of IT Services with more than 26 years of experience in software research and development and technology counseling. Backed by strong consulting, infrastructure management, and software engineering capabilities, the company provides a wide array of services to enterprises across the globe. Infopulse has assisted in the development of several blockchain-based solutions for the financial sector, including a decentralized solution for loan syndication based on Hyperledger and a “Know Your Customer” system for banks to better identify customers and manage risk. Infopulse is based in Ukraine and has over 26 years in its field. As part of Nordic IT group EVRY A/S, Infopulse is an international vendor of services in the areas of software research and development, application management, IT operations, and cybersecurity to SMEs and Fortune 100 companies across the globe. Founded in 1991, the company employs over 1,700 professionals and is represented in eight countries across Western and Eastern Europe. Infopulse brings in its extensive experience in the IT industry and expertise with blockchain, offering a wide range of blockchain-based services and solutions. Infopulse was listed among 2018 Global Outsourcing 100 companies by IAOP and currently has clients in over 20 countries across the globe.